Now Available: Shirts, Hoodies, and Posters! I hope you’ve all had a great week! I think it goes without saying how incredibly thankful I am for all of you. I appreciate every comment and every person who reads Soul Symphony. I really hope you guys enjoy it as much as I enjoy making it. 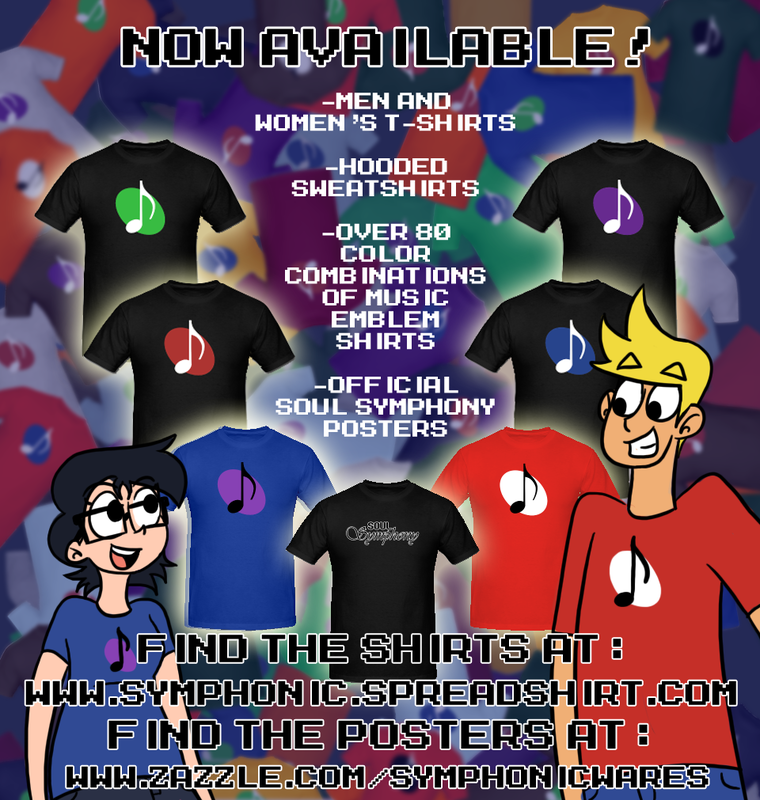 I’m proud to announce that I now have Soul Symphony/music goodies available for you! If you have any questions or comments, feel free to leave them here so I can get back to you. Thank you all, and I’ll see you on Monday! I feel like a badass shirt of all the monsters they fought would sell better than generic music note shirts. Also, I’m surprised Carl isn’t on any of the shirts. I like that idea. I’m planning to do a monster-centric poster, but I can make a t-shirt too. The only problem is that we haven’t met all of them, so it’d be a little spoilery right now. But I’ll definitely release it after the next Soul World segment. Well, damn, those shirts are nice. Do you ship overseas? Yup, but the shipping time is just a bit longer. Personally, I rather like the idea of a shirt where Carl, John, & Olivia charge forward grinning, battle-ready – all badass & glowy, with Olivia playing her clarinet. Maybe have semitransparent Eric, Ashley, Chris, & Mr. Dalton on the sidelines. Not very recognizable to nonreaders, & given that I dunno how many we number, I dunno if it’d sell… but it would be damned cool! Er, Charlie, not Chris. My bad.